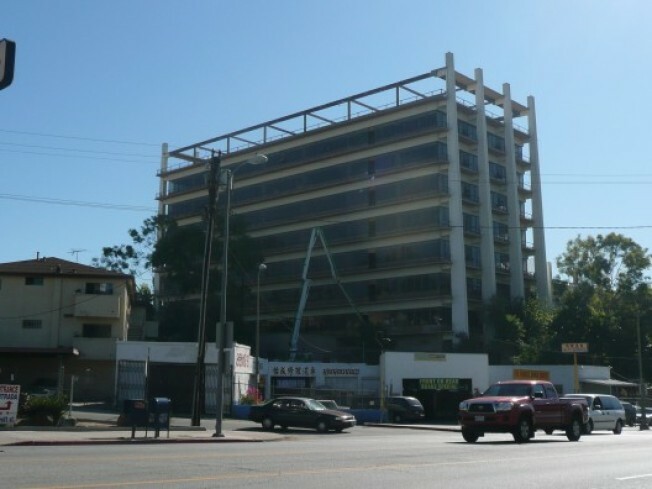 Apartments Coming to 1960s Echo Park Office Building? Something is happening! Something is happening at 1111 West Sunset Boulevard in Echo Park, that tower that once housed the headquarters of Metropolitan Water District. We've never seen construction going on at this 1960s office tower, but concrete pouring equipment was on the site today and construction workers tell us apartments are coming. City planning documents reveal that back in 2004, there was an application to convert this 8-story office building into 71 apartment units. But according to a source, developer Mika Realty Group has recently requested that 92 smaller apartment units be built instead. And Mika Realty Group's web site references a forthcoming project called Metropolitan Lofts at this address. Meanwhile, the details are a little fuzzy, but a staffer at Metropolitan Water District says their firm moved out of this property in 1992. More recently, it seems the building was owned by the Holy Hill Community Church.